Wall mounted tinted mirror vanity creating a feeling of space and the water plane top, giving it a clean modern up to date look. 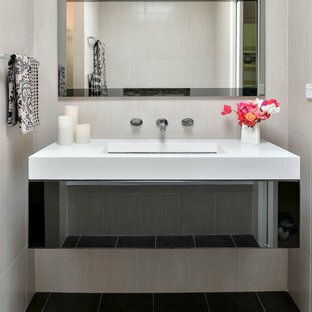 Design ideas for a medium sized contemporary ensuite bathroom in Sydney with ceramic tiles, beige walls and ceramic flooring. 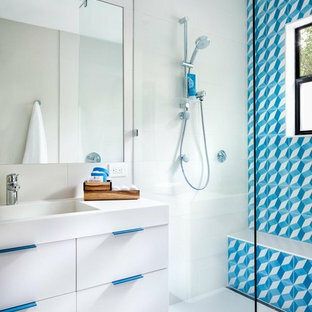 Medium sized nautical cloakroom in Miami with blue cabinets, multi-coloured tiles, a vessel sink, freestanding cabinets, mosaic tiles, marble worktops and medium hardwood flooring. Property Marketed by Hudson Place Realty - Style meets substance in this circa 1875 townhouse. Completely renovated & restored in a contemporary, yet warm & welcoming style, 295 Pavonia Avenue is the ultimate home for the 21st century urban family. Set on a 25’ wide lot, this Hamilton Park home offers an ideal open floor plan, 5 bedrooms, 3.5 baths and a private outdoor oasis. With 3,600 sq. ft. of living space, the owner’s triplex showcases a unique formal dining rotunda, living room with exposed brick and built in entertainment center, powder room and office nook. The upper bedroom floors feature a master suite separate sitting area, large walk-in closet with custom built-ins, a dream bath with an over-sized soaking tub, double vanity, separate shower and water closet. The top floor is its own private retreat complete with bedroom, full bath & large sitting room. Tailor-made for the cooking enthusiast, the chef’s kitchen features a top notch appliance package with 48” Viking refrigerator, Kuppersbusch induction cooktop, built-in double wall oven and Bosch dishwasher, Dacor espresso maker, Viking wine refrigerator, Italian Zebra marble counters and walk-in pantry. A breakfast nook leads out to the large deck and yard for seamless indoor/outdoor entertaining. Other building features include; a handsome façade with distinctive mansard roof, hardwood floors, Lutron lighting, home automation/sound system, 2 zone CAC, 3 zone radiant heat & tremendous storage, A garden level office and large one bedroom apartment with private entrances, round out this spectacular home. 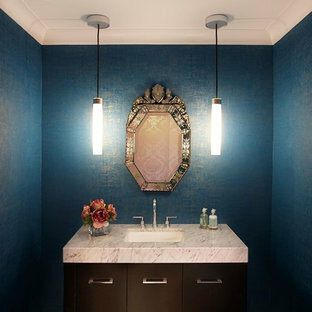 Featured Roslyn Estates Bathroom by New York Woodstock Inc.
Inspiration for a medium sized classic cloakroom in New York with a submerged sink, flat-panel cabinets, dark wood cabinets, marble worktops and blue walls. 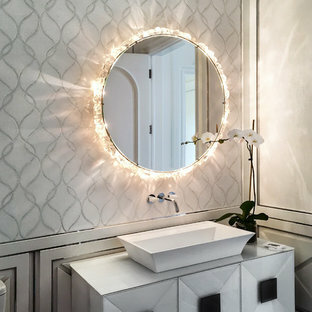 This opulent powder room is clad in contemporary white lacquered molding and features stainless steel trim accents in modern wainscoting. The walls feature a white marble mosaic with an inlay pattern that is framed in the matching white lacquer and stainless trim. 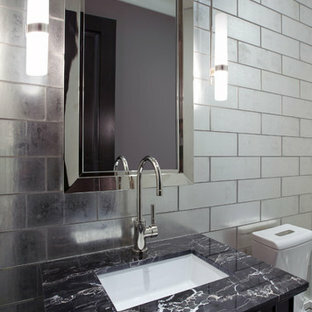 The rock-crystal backlit mirror and white vanity are set in this beautiful background. 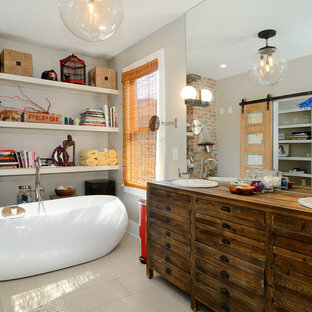 This is an example of a traditional bathroom in Chicago with a submerged sink, marble worktops and glass tiles. We sanded down the original hardwood floorboards throughout the property and added a lovely rich dark stain, making it both chic and cosy. 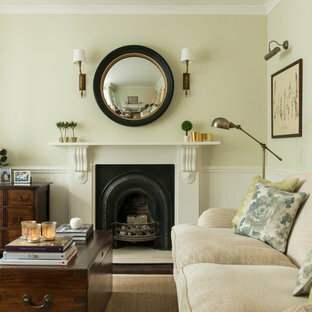 The tongue and groove panelling really adds to the cosy cottage feel of the space. We replaced the fireplace hearth with warm limestone - both fresh and light. The furniture is mostly antiques. We opened up the wall between the living room and kitchen and created an archway with double pocket doors. 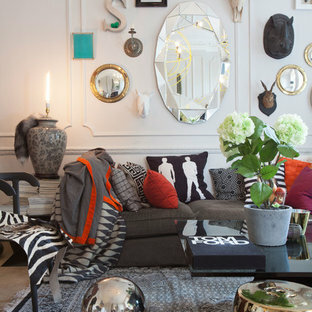 Design ideas for a bohemian formal living room in London with white walls. 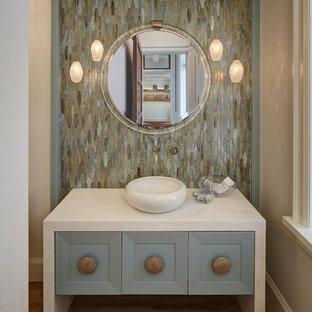 This is an example of a small contemporary cloakroom in New Orleans with a wall-mounted sink, mirror tiles and white walls. Entryway design with blue door from Osmond Designs. Photo of a contemporary master bedroom in London with white walls, concrete flooring and no fireplace. 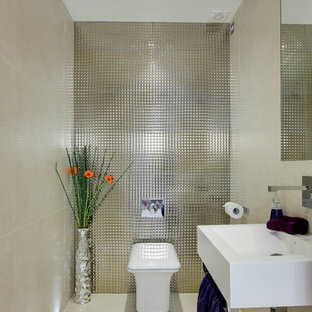 Mediterranean bathroom in Sussex with multi-coloured tiles, red tiles, grey walls, a vessel sink and concrete worktops.